At Merritt Academy, elementary students are actively engaged in learning experiences both in and out of the classroom. Every day students take part in both core and specialty classes designed to provide a breadth of experience with a strength in fundamental academics. In addition to their time in the classroom, students go on a variety of field trips and take part in hallmarks that makes the curriculum come alive. Genius Hour is a weekly favorite that students look forward to the freedom to work on and expand any topic that interests them outside the norms of the traditional curriculum! Merritt Academy recognizes each student’s unique strengths and talents and targets instruction to successfully grow and develop those skills. Our advanced, proprietary curriculum focuses on core academic subjects by balancing innovative, research backed educational practices with traditional educational methods. Our wide variety of specialty classes further support our core academics and allow students to further develop cross curricular strengths & interest. A unique aspect of math education at Merritt is our ability to individualize students’ education so that some students are placed a grade ahead. Science at Merritt is focused on Earth, Life, and Physical science along with health & hygiene and investigation and experimentation. A unique aspect of Merritt’s science program is the focus on Design and Technology. Social Studies provides instruction for students to develop skills in areas such as using maps, understanding the contributions of historical figures, and analysis of events and their impact on our lives. Merritt’s social studies program uses field trips and special events to complement what students are learning. Language Arts provides a strong foundation in writing, grammar, and reading so that students are prepared to excel in high school and beyond. Merritt’s older students use Reader’s Workshop to explore themes in books they have individually chosen thus allowing freedom of choice and fostering a love for reading. Our foreign language classes focus on teaching grammar, writing, and culture while placing a strong emphasis on oral fluency. A unique aspect to our foreign language program is that beginning in 5th grade the students have foreign language every day, making it a core class. Students continue this through middle school and graduate with high school credit in either French or Spanish. Students learn typing as well as a variety of computer skills such as Excel, HTML, and other programs. A unique aspects to our program is the development of a website by our middle school students to share the D&T Program with others. Art education at Merritt is focused on building skills as well as an understanding and awareness of artists and art history. A unique part of our program is the field trips that all classes take with the art teacher. 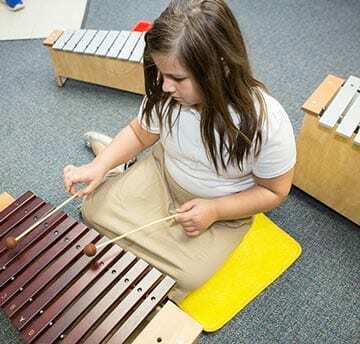 Students learn music skills as well as music theory through a variety of lessons involving vocal and instrumental techniques. A unique aspect to our music program for the older students is the focus on playing handbells. 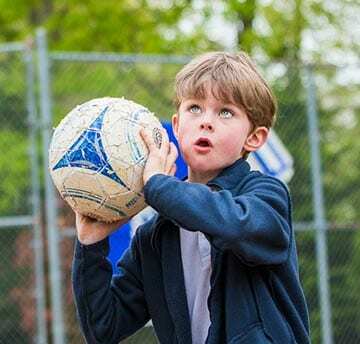 Merritt’s PE program provides instruction in a variety of sports, with a focus on building skills. A unique aspect to our PE program is that students go on field trips with the PE teacher, such as hiking the Billy Goat Trail or going kayaking. Merritt’s focus on SEL (social emotional learning) stems from the support provided by the School Counselor and the Second Steps Program used with all students. Providing this tool for students is unique and allows Merritt to help students have a well-balanced educational experience. At Merritt Academy, the academic curriculum is further enhanced with technology. Every classroom is equipped with a SMART Board. Students begin using iPads in kindergarten. 1st grade through 5th grade students have iPad to supplement classroom learning, coding, video, writing and presentation software. On Site is a fully equipped STEAM lab and a maker space which includes a 3D printer. Field Trips and Hallmarks are carefully coordinated to enrich our curriculum with a level of interactive learning that encourages excitement and participation. Students, teachers and parents regularly look forward to many of Merritt’s hallmarks as annual traditions. Constantly discovering new ways to use the greater D.C. area as our extended classroom adds an unparalleled layer to our student’s academic experience. 8:30 AM School Starts School day begins with “Merritt in the Morning”, our video broadcasted morning announcements that are scripted, presented, and filmed entirely by our middle school students. 12:00 PM Lunch Followed by a half hour of recess time outdoors. 3:30 PM School Day Ends From 3:30-4:30 students have an option to stay for teacher led study hall. Our goal at Merritt is to prepare your child to succeed in any type of high school experience. Our students head on to a variety of private, and public high schools.